Create unscheduled times for rest, reflection, integration, and nurturing important social connections. 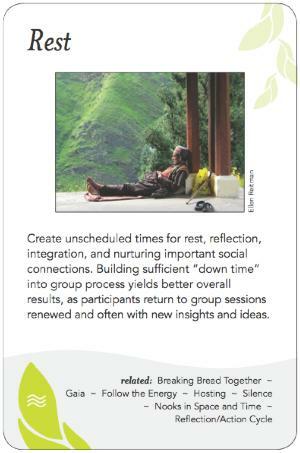 Building sufficient "down time" into group process yields better overall results, as participants return to group sessions renewed and often with new insights and ideas. a group tries to make "best use" of meeting time by omitting necessary fallow periods. If you'll be facilitating an agenda others have prepared, you need to view it in advance and give clear feedback if it's too full. Insist that the planners prioritize their most important 1-3 goals, and tell them you'll get to the rest only if the group finishes early. Think through who might speak on each item and how long it will realistically take. Better estimates of item length come with practice. 2. "Go slow to go fast." Physical and mental needs for down time are real, and if you don't allow for them the group will fail to do its best work. Get in sync with natural biorhythms for attention and activity, including those linked to time of day. Specifically avoid general discussion format (one person speaking at a time to the whole group) going beyond 90 minutes without a break. Appreciate that rest helps prevent group-think, and that engaging on a given task, moving on, and then returning at a later time allows for deeper work on each pass. Valuing people as full beings brings deeper wisdom into your group. 3. Recognize that real work happens during breaks. Key one-on-one conversations take place to move stuck issues, people form social bonds that help future work flow, fresh ideas emerge from going for a walk or sleeping on it a night. Some groups welcome inspiration from dreams that occur during overnights in group activities. 4. See the range of possibility. Sometimes a shift in format or mode of action can offer some of the same benefits as an official break, e.g. using art, dance, singing, movement, etc. Meals are a classic time for breaks, as long as you don't give people a task to do or force them to listen to a presentation while eating. Some breaks include entertainment. In a longer, multi-day event, a higher ratio of down time is needed, so plan accordingly. Sometimes a break is needed at a time you didn't plan for, so monitor the group and if people start getting fuzzy check in to see if a break is needed. In strong "Type A" cultures, you may encounter pushback over too much down time. Be prepared for a conversation that deconstructs the "time is money" equation, and to hold your ground against that pushback. Contrarily, breaks can kill the energy--sometimes it makes sense to go with the momentum that's been built. If you plan an optional activity during a break and most people decide to do it, you may need another break again soon if the reality is that people didn't really get a break. So be careful about this. And as mentioned above, running a presentation during a meal is almost always a mistake. The creators of Future Search method found that spreading it over 3 days so that participants would "sleep twice" generated a substantive improvement in the quality of results. Carol MacKinnon: Midrash process ?